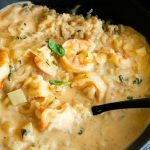 A simple comfort food recipe for Thai red curry made with succulent shrimp and potatoes in a velvety coconut cream curry sauce. Easier and better than takeout for a quick weeknight dinner. Today I’m sharing a Thai Red Curry Recipe that is jam packed with subtle flavors and is full of succulent shrimp, tender cooked potatoes, onions that literally melt in your mouth. 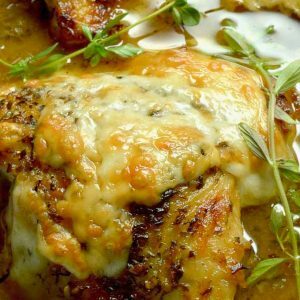 They’re surrounded with a velvety coconut cream sauce that has just the right amount of heat with the addition of red curry paste. 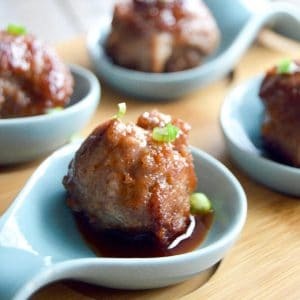 It’s no secret I’m a fan of foods with big flavor and that I’ve taken a lot of classes perfecting Thai, Chinese and French foods. Basically all ethnic foods and traditions are some of my favorite meals because I love bold flavors and trying different things. The Spicy Thai Shrimp soup was so popular earlier this year I wanted to expand on that for you for some variety. Nothing beats this homemade curry for a delicious and comforting meal when you want some authentic Thai food! To start off with all of my knowledge of Thai curries come from some specialty classes I took with Jet Tila. 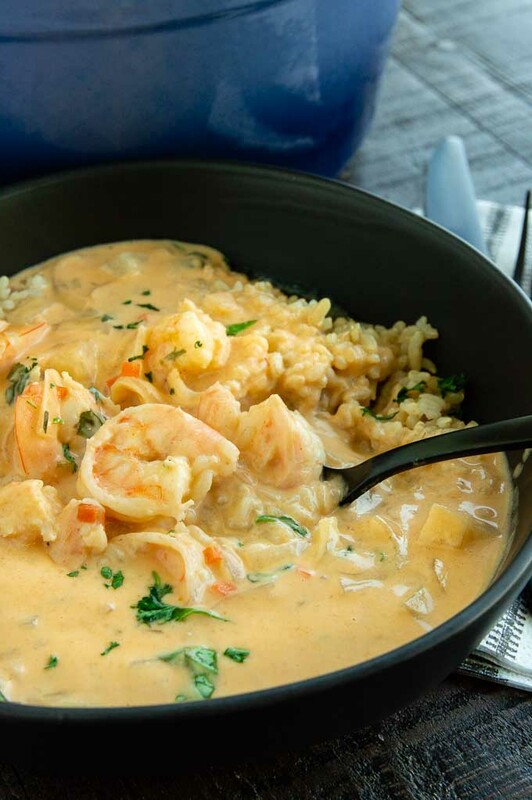 This shrimp curry recipe is an adapted version of yellow chicken curry he taught me. He’s amazing… while he doesn’t teach classes at the school where I took them you can get many of his recipes in his amazing cookbooks. 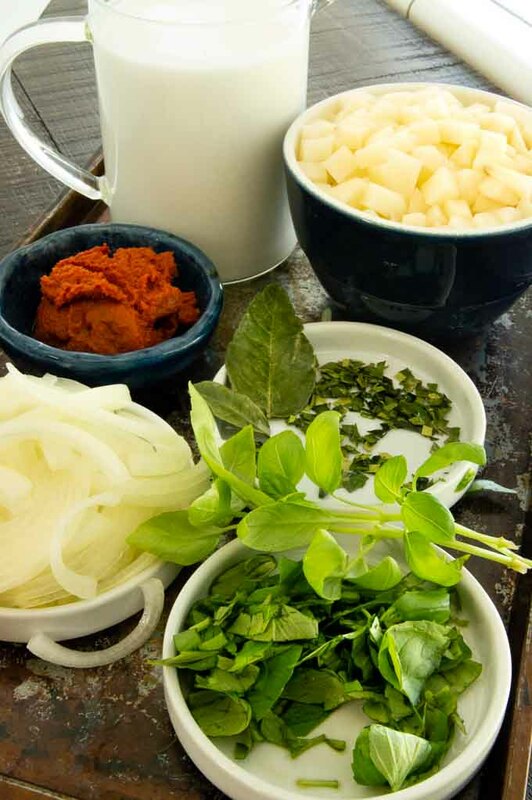 Thai Curry is a combination of many ingredients that are made from a a paste (curry paste.) 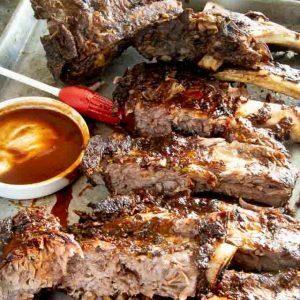 The paste is then added to coconut milk and many other fragrant and flavorful ingredients and is usually served over rice. Thai Curry pastes are wet (versus curry powders) and are very fragrant from all of the ingredients that create them. All paste bases usually begin with lemongrass, shallots, garlic and onion. 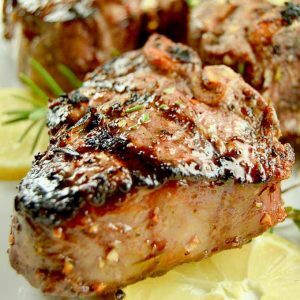 Other ingredients that might be included are kaffir lime leaves, cilantro, and coriander. The additional ingredients added to the paste will determine what kind of curry paste you end up with. Red curry, yellow curry or green curry all with varying degrees of spiciness. Fresh chilis are added to the base which make this curry paste the hottest of all of the Curry pastes. Yellow curry is the mildest of Thai curries. They generally have no peppers at all and get their color from curry powders and lots of turmeric. This is the version I serve people when they have never tried Thai food. 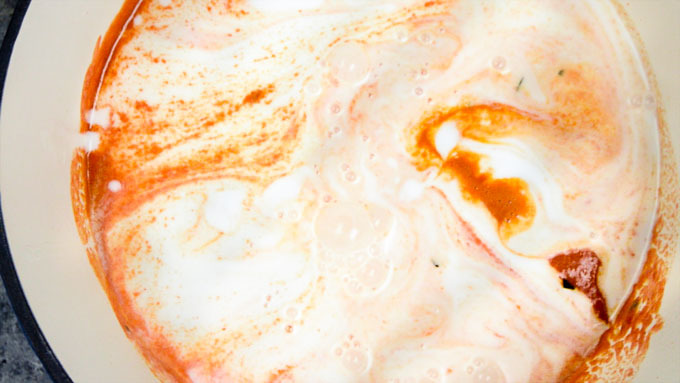 It’s not hot at all but has all of the delicious aromas and flavors that aren’t intimidating. All curry recipes can be swapped…. which is also great if you have one paste on hand versus another. If you like spicy, make this red shrimp curry using green curry (and call it Green Shrimp Curry). 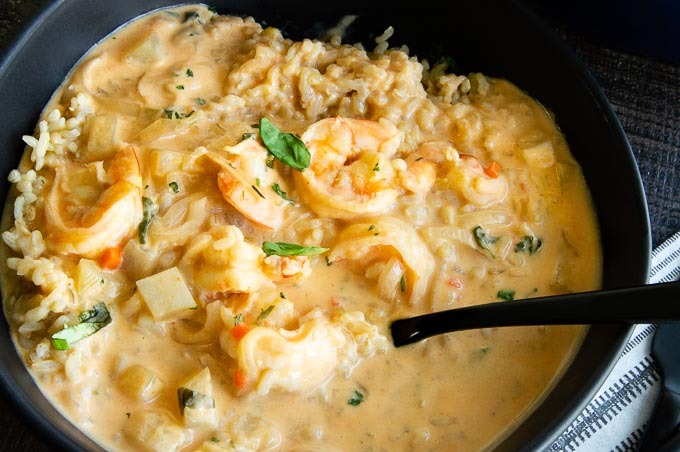 If you prefer it mild use a yellow curry and make Yellow Shrimp Curry. Along with the curry paste, the fish sauce, sugar, coconut cream, Thai basil and coconut cream flavor the curry. But all of the other ingredients are very flexible. You can sub in whatever your family or guests enjoy. Ive made it with spinach, cilantro, chicken, pork, tomatoes, tofu, red bell peppers, sweet potatoes and broccolini. 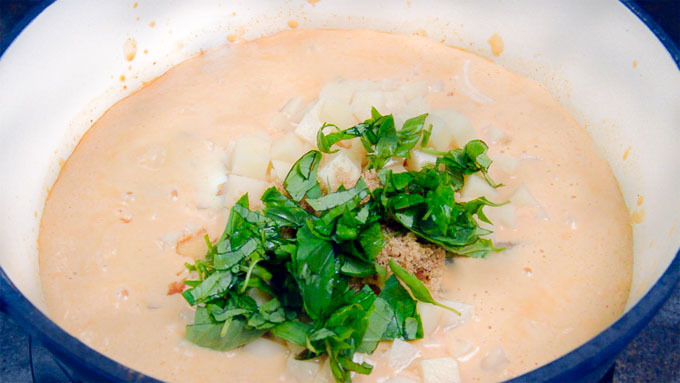 The possibilities are endless when making thai coconut curry. 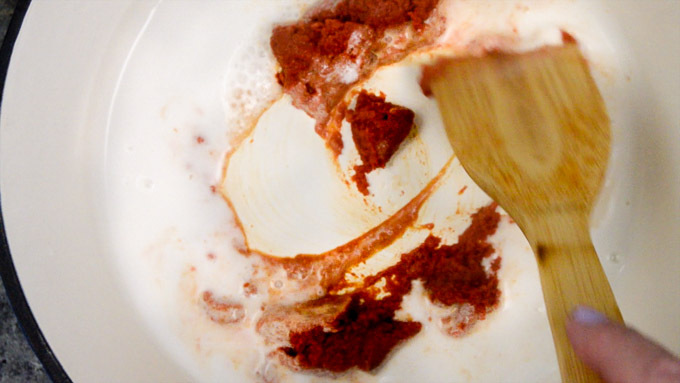 Add all of the milk and let it simmer and reduce to a nice velvety consistency. Finally add the shrimp last (you don’t want to add it with everything else to avoid hard rubbery shrimp. 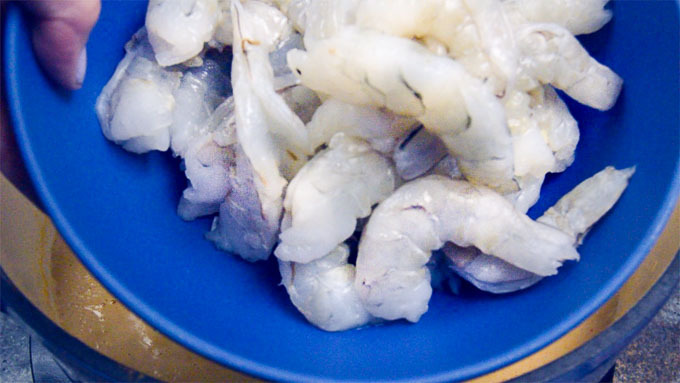 Shrimp cooks super quickly. For each tablespoon of Kaffir lime leaves the recipe calls for use the zest of half of a lime and a pinch of thyme. Where do I find all of the ingredients to make Thai Curry? Most regular grocery stores or amazon carry all of the ingredients for making authentic curry recipes. You can also look for a local asian market too. What do I serve with Red Thai Curry? Serve this red curry recipe over steamed rice for a very filling and satisfying meal. You can also serve it over rice noodles. We dont like shrimp can I make Thai Curry with anything else? 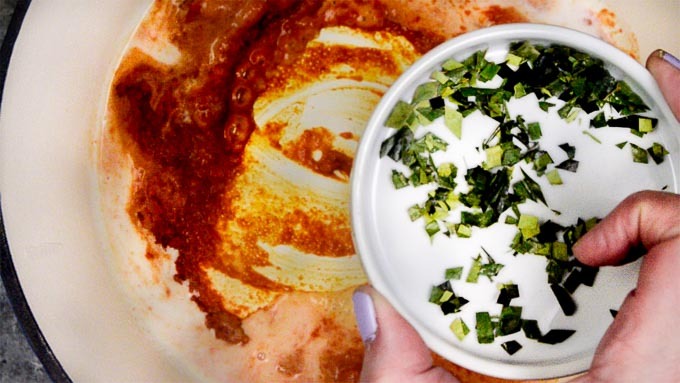 Thai Curry can be made with any protein you like. If you use chicken you’ll want to toss it in sooner than the last two minutes like you do with the shrimp. Chicken takes longer to cook so I usually add it after the potatoes have simmered for just 10 minutes. Smoky Jambalaya ~ crazy cajun deliciousness!! 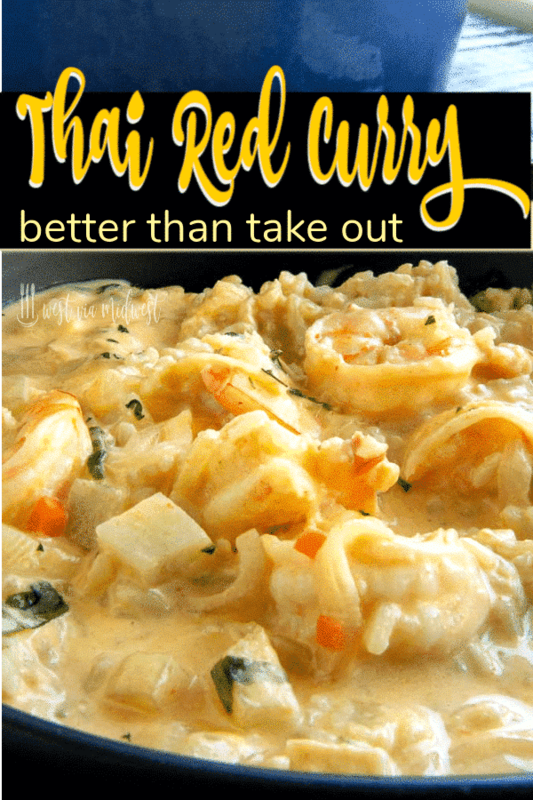 Simple comfort food recipe for thai red curry made with succulent shrimp, potatoes in a velvety coconut cream curry sauce. Easier and better than takeout for a quick weeknight dinner. 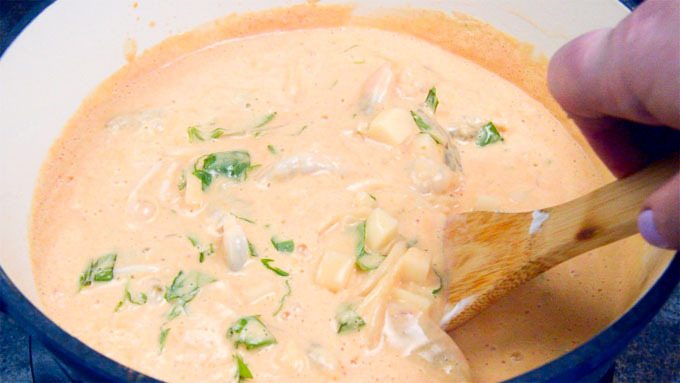 In a medium sauce pan heat a couple of tablespoons of the coconut milk for 1-2 minutes on medium heat. Then stir in curry paste and lime leaves. Stir for 1-3 minutes more until paste starts to brown. Stir in remaining coconut milk into the curry paste. Increase heat to high until boiling. Allow to boil for 5-10 minutes until it reduces by 1/4. Reduce heat to simmer. Add potatoes, basil leaves, onion, fish sauce and sugar. Let simmer for 15 minutes until potatoes are tender. Add shrimp and simmer for 3-5 minutes until opaque and cooked thru. Spoon over rice or alone. Garnish with pepper strips or diced pieces. I love Thai food and this red curry looks absolutely amazing! 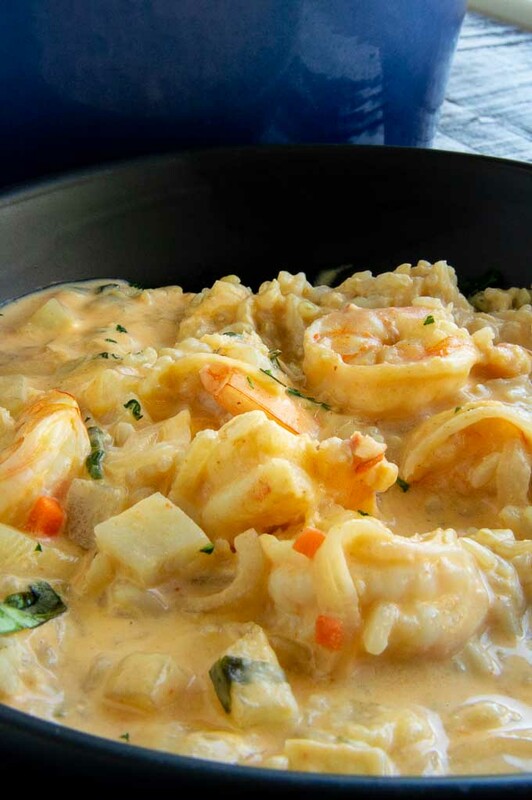 My husband loves shrimp so I will be making this for him this week. Love that you added potatoes. Such a great addition. I was pleasantly surprised at how easy it was to make.